Construction of the Rubjerg-Knude lighthouse in Jutland, Denmark straddled the last two centuries, beginning in 1899 and finishing in 1900. 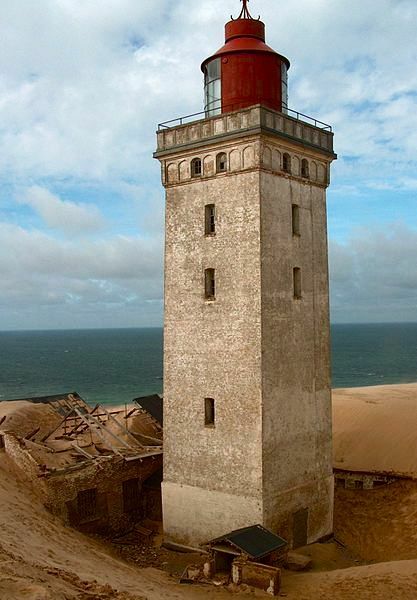 It was built on a dune-less cliff 200m away from the sea and 60m above sea level, but as the years passed the sea drew closer, and with it came the dunes, which gradually began to swallow up the base of the lighthouse. 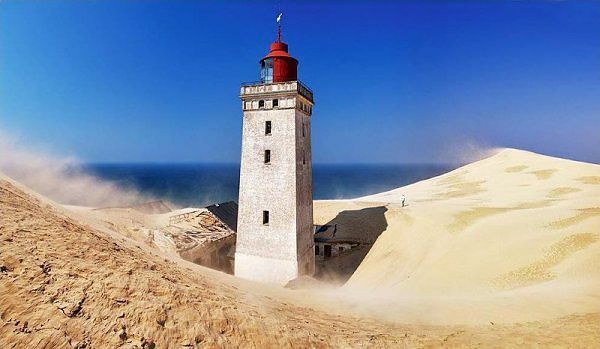 The Rubjerg-Knude, buried in sand. Image from Milan Kuminowski. 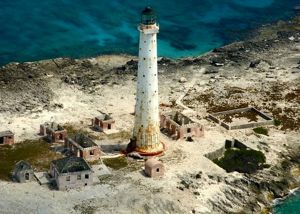 Initially it was 23 meters tall, but by 1968 only some 15 meters was accessible- the rest, including all the entrances, were stopped up and buried, finally shutting the lighthouse down. Early architectural plans. 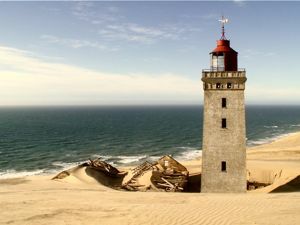 Image from Rubjerg-Knude. 1899 construction- no dunes in sight. 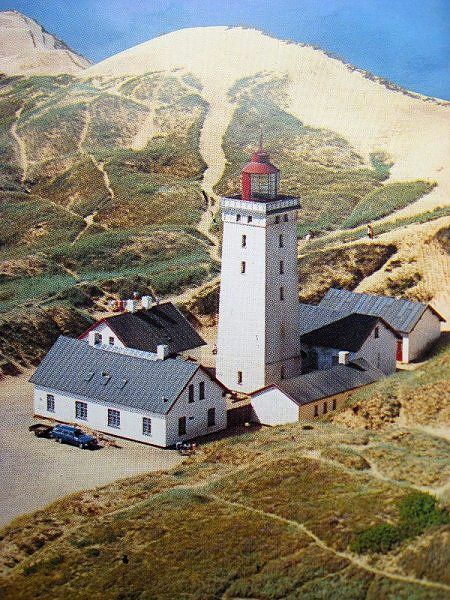 Image from Rubjerg-Knude. 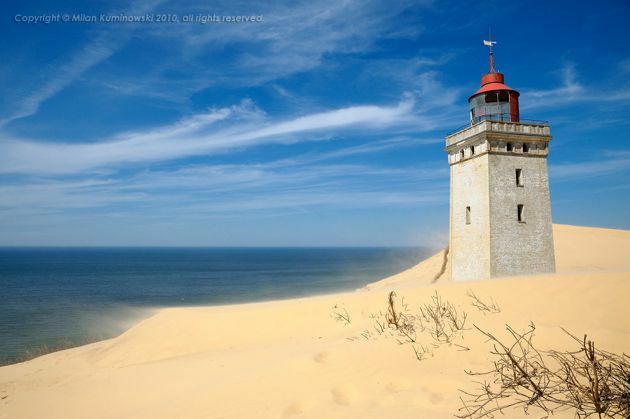 The finished lighthouse, with the dunes slowly climbing up the rise towards it. Image from Solar Energy Dream. 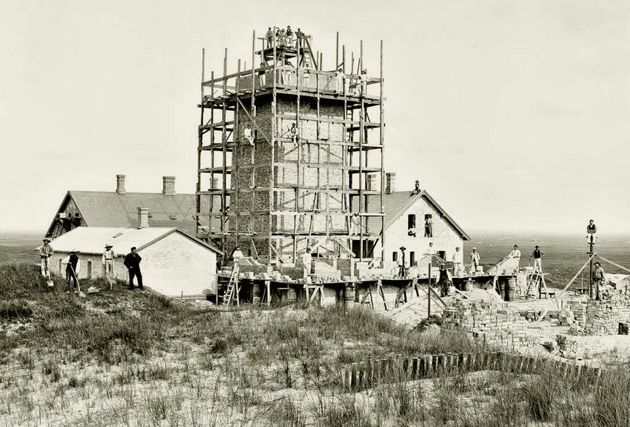 Efforts were made to protect the lighthouse over the years, with sand pine grates installed and lyme grass planted on the dunes in an attempt to halt their encroachment. 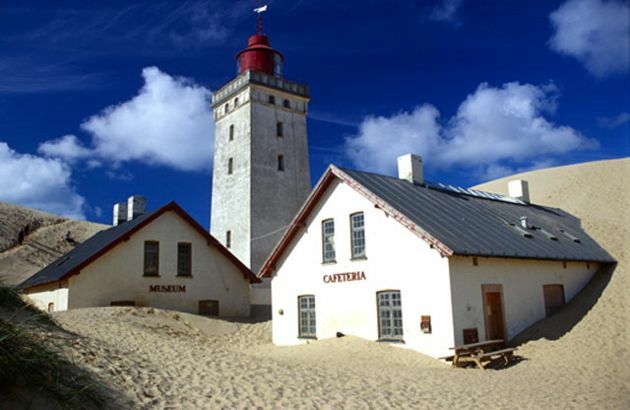 It didn’t work, and the lighthouse was shut down, but life around it didn’t halt completely- after 1968 the surrounding buildings were converted to a sand drift museum and coffee shop, which continued operation until 2002. Now though the sand has swallowed them too, caving in their roofs with its weight. Soon, as the sea draws closer and the winds endlessly blows the dunes inland, there will be nothing left of the Rubjerg-Knude at all. Swamped museum and cafeteria. Image from Ricardo Massino. Roofs buckled under the flowing weight of sand. Image by Christoph Grimlowski. Growing into the dunes. Image from Solar Energy Dream. Peeking up like Lady Liberty’s hand in Planet of the Apes. Image from Solar Energy Dream. Dead sentinel of the dunes. 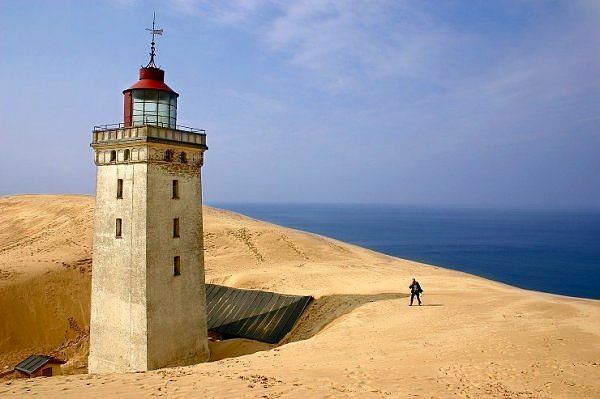 Construction of the Rubjerg-Knude lighthouse in Jutland, Denmark straddled the last two centuries, beginning in 1899 and finishing in 1900. 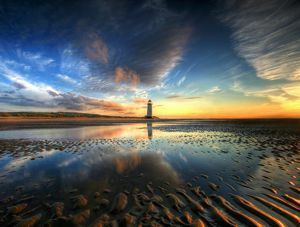 The Talacre lighthouse, officially titled ‘Point of Ayr’, has stood on Talacre Beach in various incarnations since 1776, watching over ships make the trek across Liverpool Bay from the Welsh town of Lllandudno. 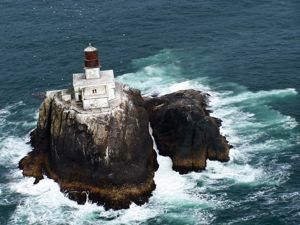 The Tillamook Rock Light was built in 1881 on a rock off Oregon coast. It was born in blood; with its grand opening overshadowed by a nearby shipwreck just days before its guardian gas-light was lit. 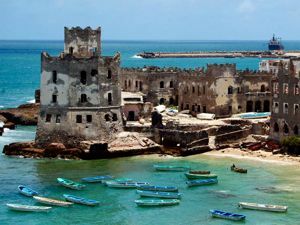 The crumbling Italian lighthouse perched on the edge of Mogadishu’s Old Harbor was built over a century ago, and abandoned some 20 years ago as trade dried up to the failed state of Somalia. 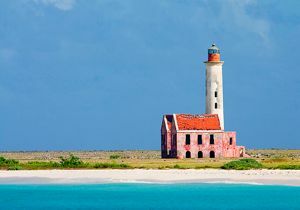 The lighthouse on Great Isaac Cay, a small island in the Bahamas around 20 miles north-east of the Bimini Islands, was built in 1859 to guide trade-ships carrying exports of sun-dried sea salt from Inagua The Klein Curacao (‘Little Curacao’) lighthouse was first built in 1850, on a tiny spit of land 11km off the southeastern tip of Curacao in the Caribbean Sea. 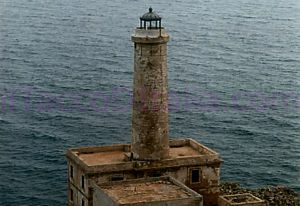 The Capo d’Otranto lighthouse was built in 1867, situated at Italy’s most eastern point, marking the point where the Ionian and Adriatic Seas meet. 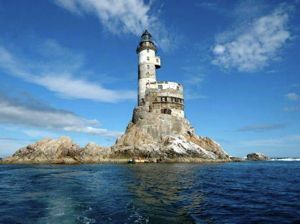 It was abandoned in the 1970’s The Aniva lighthouse was built by the Japanese in 1939, on a chunk of rock off the southern coast of Sakhalin, a thin 950 km long island situated just east of Russia. 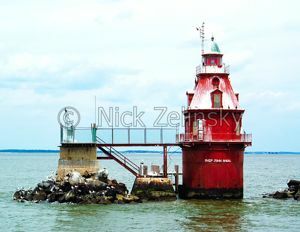 Construction of the Ship John Shoal Lighthouse in Delaware Bay took 27 years, from a decision by the US Congress in 1850 that a light was needed through various incarnations. 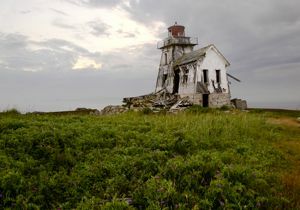 The Grand Harbor Lighthouse on Fish Fluke Point, Ross Island, was built in 1879, a square wooden tower 32-feet tall with the Keeper’s dwelling attached. See many more abandoned places in the ruins gallery. You can also read SF & Fantasy stories inspired by ruins. If you enjoyed this post, why not SUBSCRIBE.